At the end of last year’s growing season I noticed several volunteer tomato seedlings had started in the raised bed where I had just removed the spent plant that had produced all summer long. Because of my particular love for tomatoes, I couldn’t bear to just let them die, but the cold winds of late October were threatening, so I had to work fast. I transplanted those tiny week-old seedlings into small nursery pots and brought them indoors. A few weeks later I moved them all into 3 and 5 gallon buckets. 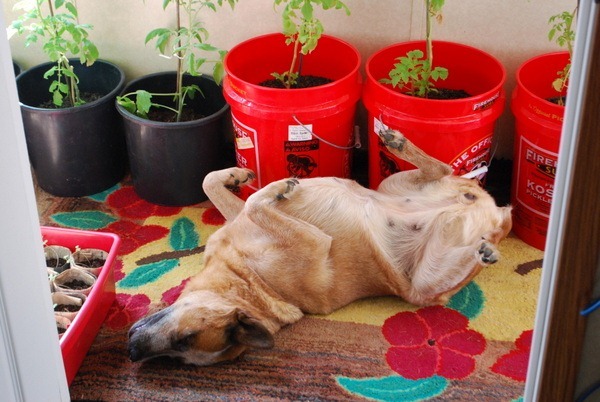 The photo above is of my beloved Sadie taking a nap amidst a forest of tomato seedlings last January. The process is really quite simple to grow tomatoes indoors, but it does require a great deal of light and space. If you have both, here’s how to do it. 1. When your tomato seedlings are ready for transplant, that’s to say that they are at least 5-6” tall, ready your 5 gallon bucket for planting by drilling a few holes in the base for drainage. Fill the container with about 8” of soil. NOTE: Do not use garden soil in containers. It is too dense and will compact and impede the ability of the roots to breathe. 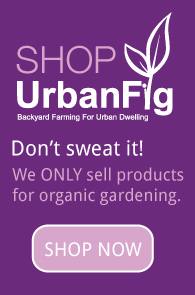 Use a potting soil or garden mix that is specifically designed for containers. 2. Transplant your tomato seedling into the bucket at the same depth it is currently growing and water thoroughly. 3. Make sure that your tomato plant gets at least 8-10 hours of light every day. In most cases and especially in winter, this will require the use of artificial light sources (a simple shop light from a home improvement store will work just fine). 4. As the tomato seedlings grows, pinch off the lower leaves and add soil, always ensuring that you leave at least 4-5” of the plant above the soil line. Continue this process over the coming weeks until the plant is higher than the rim of the bucket. 5. Put your stake or tomato cage in place as soon as the plant is at the top of the container to minimize root system damage. When using a stake or cage, make sure that it goes deep enough into the container to support the plant even if it is lightly bumped. When your tomato plants begin to bloom, check out this post for tips on how to ensure that they are pollinated and will become tomatoes.